St Patrick’s Day is about green and maybe some luck but if you are a women wearing this t-shirt then you don’t really need much luck as it has the logo of two superhero’s on it. 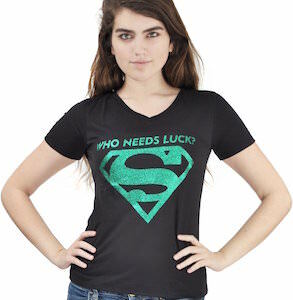 The black t-shirt shows the famous Superman and Supergirl logo in sparkling green and above it the words “Who Needs Luck?”. Besides being perfect for St Patrick’s Day this t-shirt is also just great because it has the logo of Supergirl on it and it sparkles. You can get this who needs luck t-shirt in women’s junior sizes Small – XL. Move over Superman you have nothing on Super Mom! On this t-shirt you will find the classic Superman logo but instead of an “S” you have the diamond shaped red border with a red “M” in the middle then filled in with yellow. Now print this onto the right blue colored t-shirt and Super Mom is ready to take flight. You can get this t-shirt in a huge selection of women’s fitted sizes that range from Small to 2XL and it is available in 18 different fun colors, made from 100% cotton to give you durabliltiy and comfort eaxactly what is needed in a t-shirt. The print can be put on the front or back and check out all of the different styles of shirts too. Get a closer look at the Women’s Fitted Super Mom M Logo T-Shirt. Every Superhero has a hobby, did you ever wonder what the members of the Justice League like to do in their spare time. Superman, Batman, Flash and the Green Lantern have decide to keep the Justice League together on their off time and form a rock band. Find Superman on the lead guitar, Batman playing the base, Flash on the keyboard and Green Lantern banging away on the drums. This t-shirt is made from 100% cotton and is available in many sizes and a wide variety of styles, also you have an enormous total of 21 different colors to choose from. 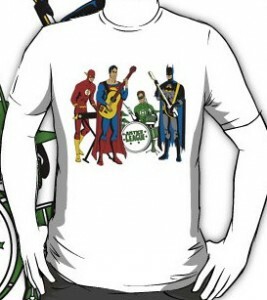 Support the Superheroes with the Justice League Rock Band T-Shirt. Superman can drink with the Irish! This is a great t-shirt for the Superman fan and the Irishman, with a nice Superman sheild with the colors of the Irish flag on a t-shirt that is green you will stand out and prove that Superman does not have a weakness to drinking. Found in many sizes, this Irish Superman logo t-shirt is perfect for St. Patricks day or any day really. Get your Irish Superman Logo T-Shirt. This t-shirt shows the famous S logo that we all know Superman of. But this logo is not just the Superman S no there are flares of lights coming off it and that really looks stunning. Why get a boring Superman logo t-shirt when you can have something as amazing as this one. And this Superman t-shirt is 100% cotton and comes in a huge range of sizes. 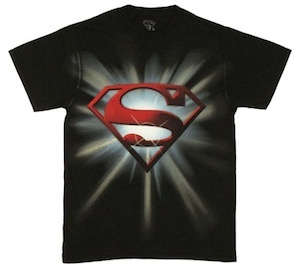 Make Superman shine with this Superman Flare T-Shirt. If you need a fathers day gift and you dad like Superman then maybe think of getting him a shirt like this. 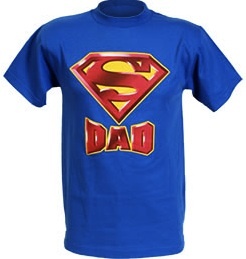 A Superman blue t-shirt with the Superman logo S and below that the word Dad. Everyday would love to be call Superman so think about getting him this Superman Dad T-Shirt. This is one of those t-shirt’s that we don’t have to say much about because it is so clear to start with. The shirt is blue and then there is the classic Superman logo. A great shirt to show the world how super you are. So if you are a superhero then look no further and get your own Superman Logo T-Shirt.